Everyone has one person in their life that is impossible to shop for. Whether you think they already have everything they could want or you think their tastes are too particular, buying this person a gift stresses you out every year. Stop stressing. The solution to the hard to shop for person is to buy a unique gift. 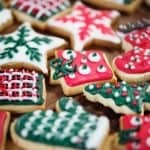 Unique gifts go over well because they are unexpected and show that you put in effort to pick a special gift just for that person. We have a variety of unique products for you to choose from to surprise someone in your life with something sweet and unexpected. MERMAID TAILS BY PIXYTAILS INC. Truth Vitality is a collection of skin and hair care products that utilizes unique technology and formulations you cannot find elsewhere in order to give women the younger-looking hair and skin they desire. Truth Vitality emerged from the unique community of women that test anti-aging products and then post their objective reviews, helping women choose the perfect product for any skin and hair concern they may have. Truth Vitality has now grown into a dedicated brand offering products that can visibly improve your skin and hair. 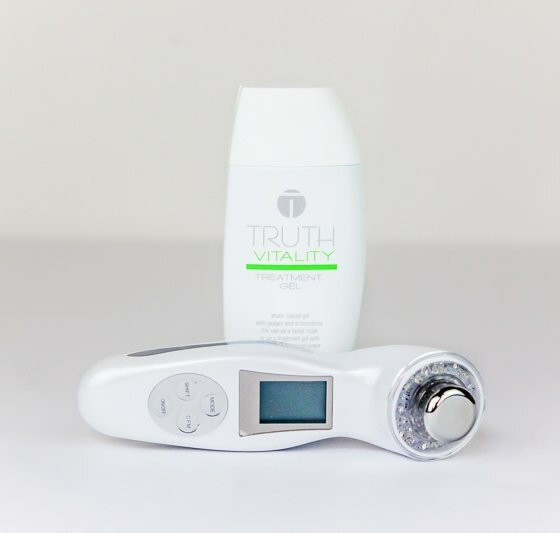 Truth Vitality Lux Renew with LED and Ultrasound is a hand-held, FDA-cleared anti-aging device that helps you reduce signs of aging and combat acne. The first device of its kind to be approved by the FDA, Lux Renew combines ultrasound technology with LED light therapy to increase your skin’s elasticity and decrease fine lines, redness and broken veins. Lux Renew is a device suitable for all skin types, and in combination with a gel or serum it can be used painlessly on the face and neck area. 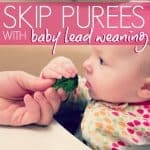 Best of all, it is backed by a successful 12-week clinical trial and it is completely safe to use at home. In fact, the results you get will rival those of a visit to your dermatologist. The Truth Vitality Lux Renew with LED and Ultrasound is the perfect gift for women who are looking for alternative anti-aging treatments. With this beauty device, reducing signs of aging and acne in a simple, painless, and safe way from the comfort of their home is guaranteed to make them happy. Chasing Fireflies is dedicated to creating magical children’s products that surprise, delight, and charm. They feature and create products that are of the highest quality with great attention to detail, style, and uniqueness. Chasing Fireflies strives to celebrate both childhood and parenthood by curating the most magical and special products. These plush sleeping bags are beautifully appliquéd in a unique character pattern that your child will love. 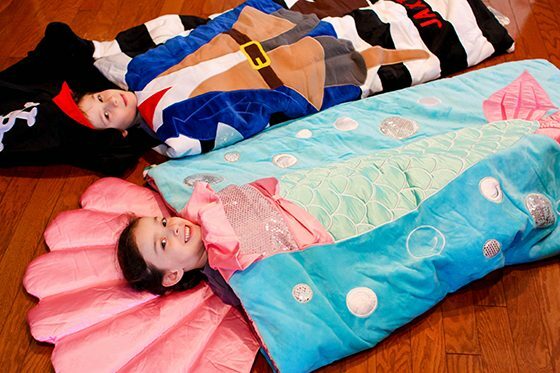 Choose from personalized sleeping bags in the style of a pirate, mermaid, Batman, Disney’s Frozen, Hello Kitty, cowboy, cowgirl, horses, fire truck, and more! The sleeping bag fully unzips for easy access and is the perfect size for both comfort and allowing room to grow. Children 3 and up will love these personalized sleeping bags. They are a fun place for both rest and play! These sleeping bags are great for sleepovers, campouts in the backyard, and naps in the living room. S Preston Art & Designs began with a love for all things sports, and a special talent for creating stunning artwork. S Preston took his love for sports and went to broadcasting school, and was immersed in the world of athletics. But that wasn’t enough. 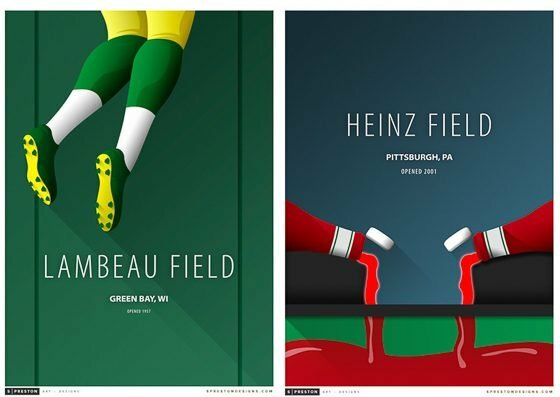 He’d occasionally doodle minimalist artwork, based on all the sports stadiums he traveled to as a broadcaster, and realized that there was something special in these drawings. And so, S Preston Art & Designs was born. His designs have been featured on Deadspin, Sports Illustrated, ESPN, Bleacher Reports, FanSided, USA Today, Entertainment Weekly, and more – and his designs are also featured in four different ballparks and in the offices of many MLB executives and corporate leaders. Prepare to blow your sports-obsessed loved one away this holiday season with art prints from S Preston Art & Designs. We truly have never seen anything like these stunning prints – this is one of the most unique collections we have ever come across. 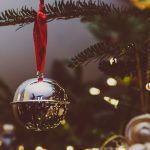 If you’re hesitant to deck your halls with loads of typical sports memorabilia and photography, these designs are the perfect compromise of sports enthusiasm and modern art design. 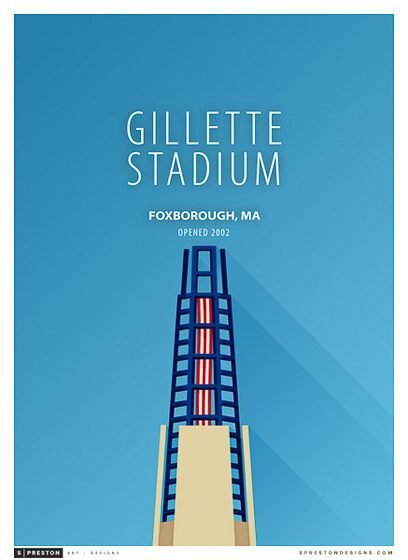 Each one of these tasteful prints highlights iconic aspects of NFL stadiums – from Gillette’s lighthouse structure to Heinz’ giant ketchup bottles, with a cool, fresh look that you’ll be proud to display in your home. When you order from S Preston Art & Designs you can be confident knowing that your print will last a lifetime – each is a museum quality art print printed with a giclée art printer using pigment-based archival ink that is rated to last 100 years and resilient to direct sunlight. They print on 300gsm archival fine art paper that is museum grade, which means it will truly stand the test of time. S Preston Art & Designs also offers minimalist prints of college football stadiums, MLB teams, and heritage ballparks, so there’s something for every sports lover in your life. If you’re tired of buying your sports-obsessed loved one items like jerseys, t-shirts, and hats, and you really want to impress them with something meaningful and beautiful – and something that will last forever, a minimalist stadium print from S Preston Art & Designs should rocket to the top of your shopping list. This is an instant conversation piece that’s guaranteed to impress! Laurent Doll was founded in 2009 by a mother-son team, Kathy Cahill and her son, Scott. Kathy had been creating doll beds, linens, and dresses for her granddaughter and after being approached by fellow moms about where to buy her products, she decided it was time to set up a shop. A winner of several industry awards, Laurent Doll creates some of the highest quality doll products on the market. 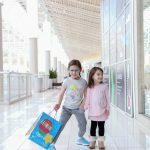 Made to fit American Girl and other 18 inch dolls, your child can pamper his or her doll with the beds, furniture, accessories and clothing offered by this incredible company. 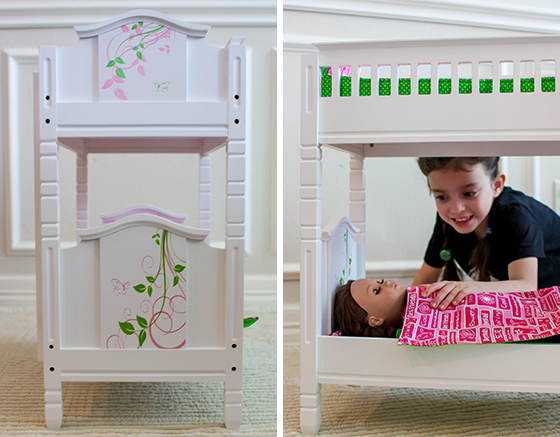 We are in love with the Doll Bunk Bed from Laurent Doll. The bed is made of solid wood with a white finish and includes two sets of paisley linens. The bed comes in a classic Cape Cod style that will look beautiful in any home. 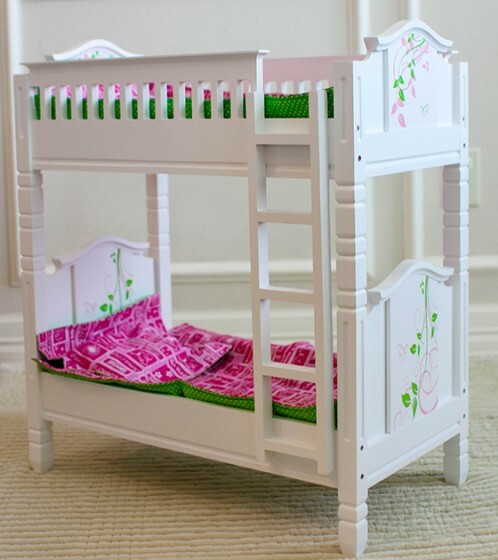 The bed ends are beautifully painted with a pink and green butterfly and swirl pattern. The doll bed is both elegant and sweet. All doll furniture comes flat packed and is very easy to assemble. The Doll Bunk Bed by Laurent Doll is perfect for any little girl or boy who loves to care for a special doll. This bed encourages imaginative and nurturing play. 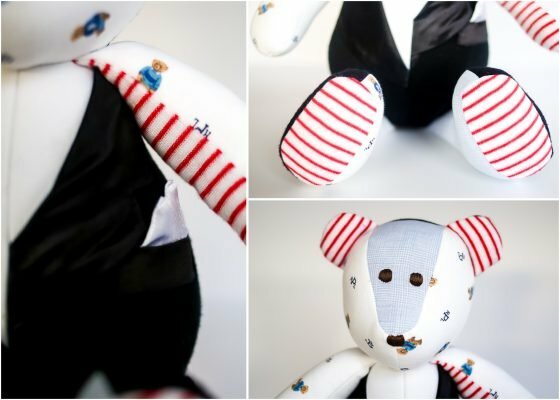 Founded by Jennifer Cura in 2004, The Patchwork Bear is a unique and personal collection of handmade products. What began as just a simple baby quilt and matching bear grew quickly into a collection that included tooth fairy pillows, photo memory quilts, wedding dress quilts, custom bears and full nursery design. Their newest collection, the “Keepsake Collection” has taken heartfelt and personalized products another step further. Though over the years Jennifer has seem tremendous growth, The Patchwork Bear continues to stay true to its humble beginnings. The initial concept of offering original, thoughtfully designed products that are handmade with love in the USA still holds true today. Items like clothing and blankets are often kept for many years, possibly stored away. They carry sentimental value. This could be sentimental value from your child’s “home from the hospital” outfit or first communion; maybe even clothing from relatives who have passed on. It is amazing the things we hold onto in an attempt to capture a memory. With a Keepsake Memory Clothes Bear you have a wonderful way to turn those memories into something you can keep and treasure forever. 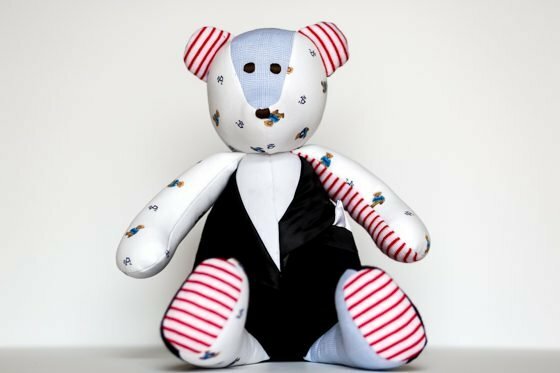 These handmade, custom bears are lovingly stitched together with the fabric or clothing of your choice. 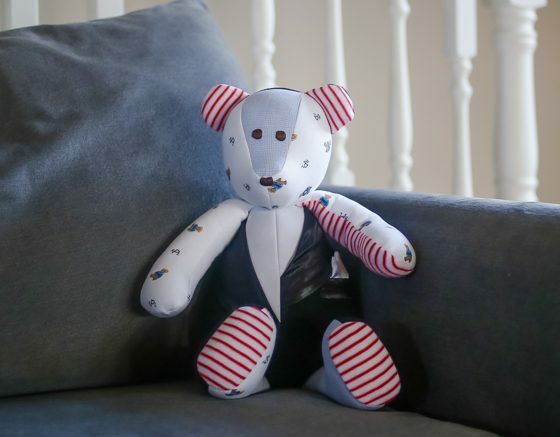 Each bear is hand-cut and professionally sewn in their studio in Princeton, NJ. Each has hand-embroidered eyes and nose (no small parts to pose choking hazards to small children). What is better than something that is both adorable and sentimental? This is the perfect gift for anybody who would love and appreciate a unique gift that is sentimental and close to the heart. Restaurant owner Quinn O’Sullivan decided to take matters into his own hands after watching countless glasses slip from the hands of his employees, shattering into sharp pieces on the ground. He was tired of the wasted glasses and extra work, but didn’t want to switch to cheap plastic glasses that couldn’t stand up to the aggressiveness of daily restaurant use. Together with Dr. Paul Fenelon, a master in the science of plastics, they designed a line of beautiful, glass-like PUBWARE that is virtually unbreakable. Every home kitchen could use new drinkware that is impervious to breaking, especially homes where young children run rampant. 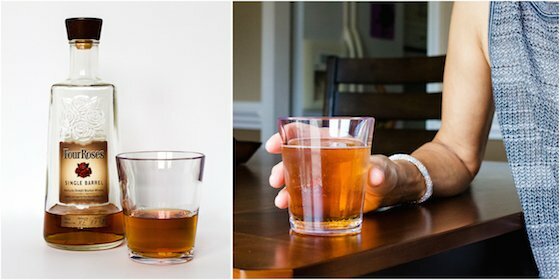 Gift anyone who loves a fine glass of wine, a swig of craft beer, or a strong shot of bourbon a set of unbreakable PUBWARE glasses this holiday. A 10 oz. Old Fashioned glass is perfect for enjoying strong liqueurs, but there’s no reason why you can’t drink your morning orange juice from this unbreakable glass. 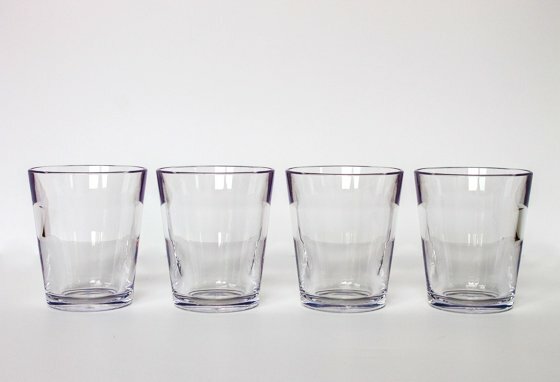 Made from symGLASS, which is a unique organic molecular glass, these glasses look just like real glass drinkware, but stand up to the test of time and the aggression of everyday use. PUBWARE is perfect for your mom, your grandfather, your best friend, your aunt… basically anyone who owns a kitchen and appreciates a good drink in a quality, elegant glass; a glass that won’t ruin the party when dropped from the hands of your coworker who had one too many! The owner of Pixytails Inc. is a graduate of The Fashion Institute of Technology in New York, New York. Now she lives on the west coast of beautiful Florida! She has always had the desire to design and make her own costumes, including mermaid costumes, matching doll mermaid costumes, fairy wings, and much more! This stunning mermaid tail flares into a fishtail! Pixytails Inc. recommends using your mermaid tail for pretend play costumes: by the sea, poolside, bathing suit cover up, photo-shoots, and general play around the house. Allow your little one’s imagination to go wild, but in a safe environment. Don’t forget to order a set of fairy wings so your little mermaid has the chance to meta-morph into a beautiful fairy. 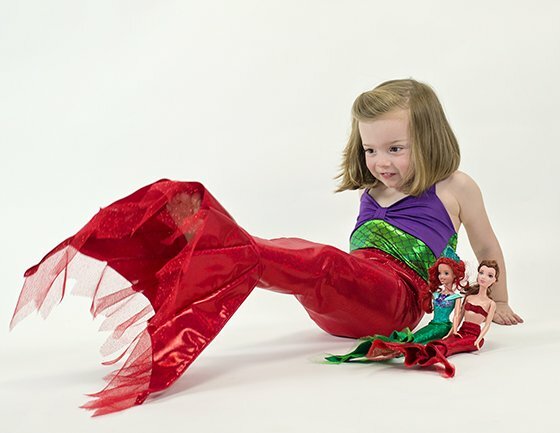 Pixytails Inc. mermaid tails are made from a stretch material, similar to a bathing suit. Although the material is safe for water, swimming is not recommended. “Sea” that adorable little mermaid? Your little one will look swimmingly in this Pixytails Mermaid costume. The Pixytails Inc. is ideal for toddler, tweens, teens, and mommies. Pixytails are great for anyone with a fun and creative imagination. Over the last 70 years, Marvel Entertainment, LLC, has provided the world with 8,000+ classic, beloved and timeless characters through a variety of media outlets. A leading brand in art, entertainment and print, Marvel is a wholly owned subsidiary of The Walt Disney Company. A truly timeless brand, chances are you and your parents alike have grown up with fond memories of your favorite Marvel characters, and your children and grandchildren will do the same. Joe Quesda’s exclusive design for Marvel, the “Revolution” lithograph, is the ultimate gift for any Marvel fan. This powerhouse grouping of some of the most prominent and noteworthy Marvel characters of all time boasts vibrant colors with a deep, 3D elemental display. The white background with rich black matting makes this lithograph pop with a fierceness. Frame this unique piece of art and it will instantly become an eye-catcher on any wall. This limited edition “Revolution” is one in only 1,000 in print. Snag one for the Marvel fan in your life before they’re gone forever! 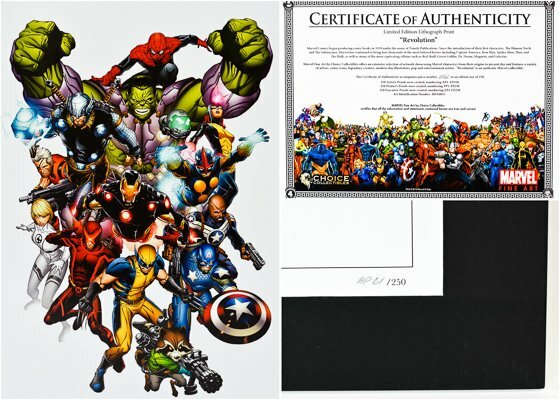 Marvel’s “Revolution” lithograph is a “one in one-thousand” gift for Marvel fans young and old! 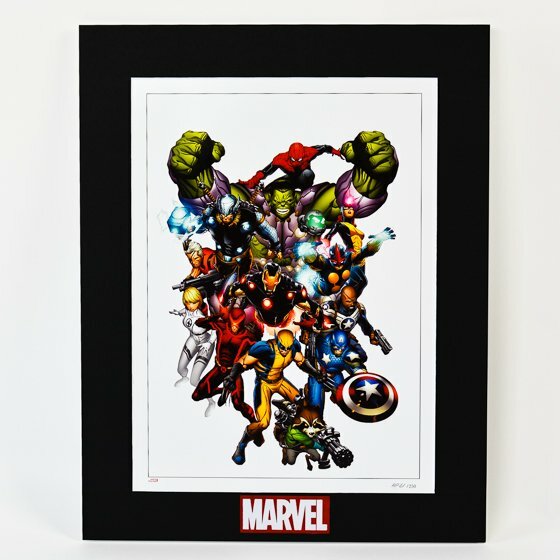 From its bold colors and most beloved Marvel characters bursting from the bright white print, this lithograph will bring joy to all who view it. This matted masterpiece will be the focal point of any Marvel fan’s home decor. Originally affiliated with the San Francisco Chronicle newspaper, Chronicle Books was founded in 1967 with one single employee. Now an independent company with over 200 employees, Chronicle Books produces over 330 books a year. Their book categories range from lifestyle, art, children’s, pop culture and food and drink. Lists of Note – An Eclectic Collection Deserving of a Wider Audience houses 125 fascinating entries of to-do wish lists, notes, pros and cons, rants, secret documents and more from historical figures to the Hollywood elite over centuries. This collection offers those who wish to delve into the human psyche an opportunity to view these private archives that would normally never see the light of day. 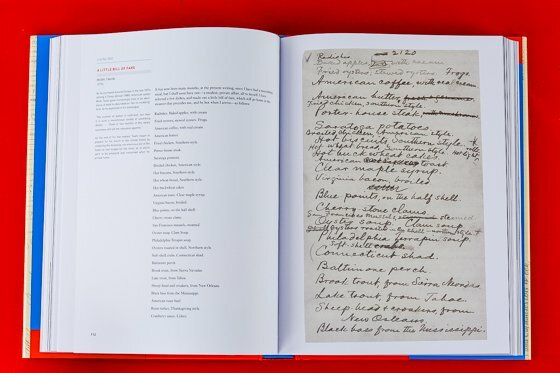 Some of the most fascinating entries include: A list of murder suspects compiled by John F. Kennedy’s secretary just hours after his assassination, Albert Einstein’s list of demands of his estranged wife, a random “Things To Do Today” list written by Johnny Cash and much, much more. This book will command the attention of anyone who picks it up; and they simply will not be able to put it down! 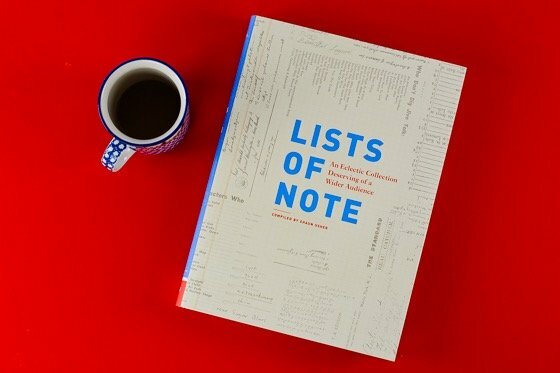 Lists of Note – An Eclectic Collection Deserving of a Wider Audience is the perfect gift for the book collector in your life who likes to explore the humanity behind people and things in life. This not only makes a great coffee table addition, where house guests and friends can skim selections and converse about them, but it’s also a must-read from cover to cover! Originally affiliated with the San Francisco Chronicle newspaper, Chronicle Bookswas founded in 1967 with one single employee. Now an independent company with over 200 employees, Chronicle Books produces over 330 books a year. Their book categories range from lifestyle, art, children’s, pop culture and food and drink. 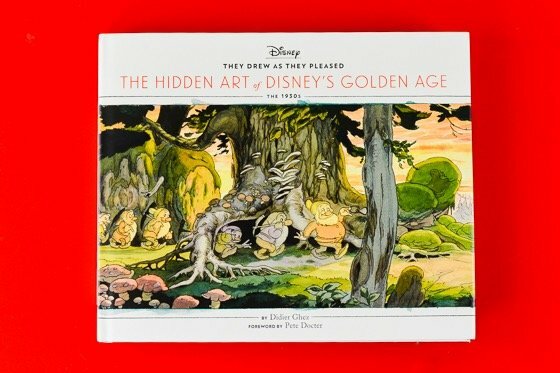 They Drew As They Pleased – The Hidden Art of Disney’s Golden Age is the first volume in a fascinating series of books about the Disney Studio’s overlooked concept artists. The series plans on exploring these artists and their work, much of which has never been seen, between the 1930s and 1990s. During its first decade, as The Walt Disney Studio took on some of their biggest animated features, they hired “concept artists” whose entire goal was to inspire their fellow animators and explore artistic ideas. From the depths of the Disney archives, They Drew As They Pleased, showcases the stories and artwork of four of these pioneer concept artists during the 1930s. 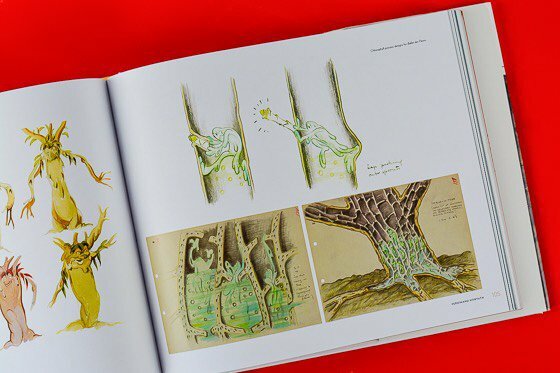 This exciting collection includes artwork from early Disney shorts, many of which were never produced, as well as their drawings and imagery from the classics: Snow White and the Seven Dwarfs, Pinocchio, Alice in Wonderland and Peter Pan. 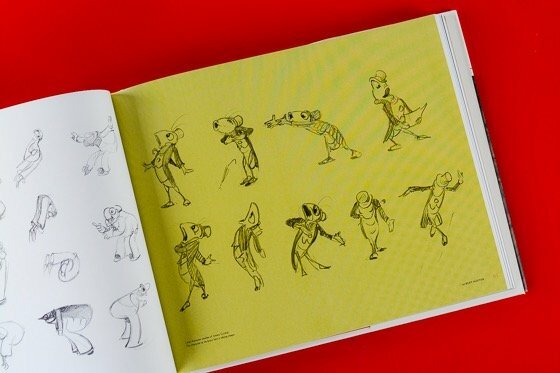 They Drew As They Pleased – The Hidden Art of Disney’s Golden Age is a must-have for any Disney fan, young or old, who appreciates the behind the scenes aspect of the art that goes into making animated features. 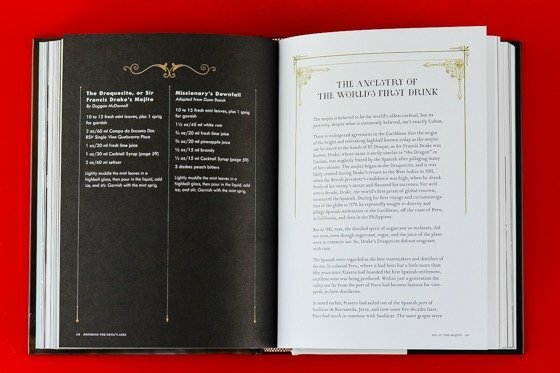 This book will become a timeless treasure in your loved one’s collection. It became clear that there was a need for a product that solves the problems boot owners everywhere have. Andy can’t pinpoint exactly why, but Andy thought it was likely that there was a better solution, and that it just did not yet exist. So, Andy got to work. At last, the solution that Andy sought has taken full form in Boot Butler: a much needed boot storage solution like none other. Andy hopes that you find Boot Butler to be the answer that you’ve been searching for as well. You’re unique. Your closet space is, too. Boot Butler is modular. That means that you can take it apart and put it back together again to match the number of boots you need to store and the space that you have available. 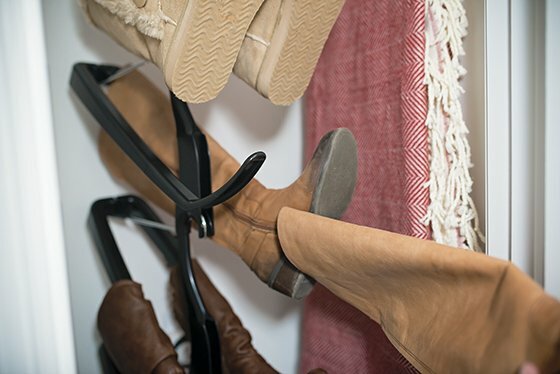 Whether you have a walk-in closet or a tiny cubby in a cramped apartment, Boot Butler will help you to create your ideal storage space.Organize your boots in half the space. Hang up to five pairs just like your coat. No more messy piles of boots. No more creases which extends the life of your valuable boots and preserves the shape. Save time when you’re picking out what to wear. 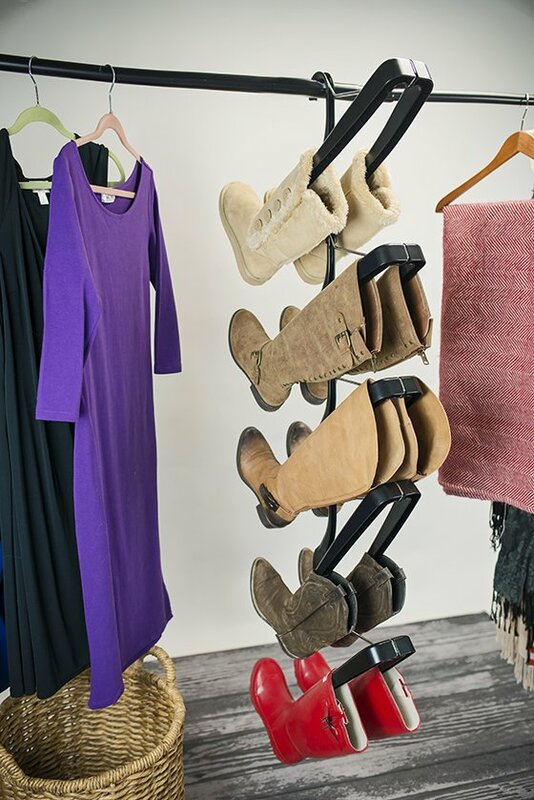 Boot Butler hangs off of any standard closet rod. It handles even tall, heavy work boots, keeping them secure while saving you space. Even better, it’ll give you an excuse to treat yourself to a new pair of boots or two. Stores nearly all boots: cowboy, riding, fashion, rain, winter/snow, high heeled, and more. Can be adjusted to fit most closets. Takes up just 7 inches (17.8 CM) of closet rod space. Fits in a vertical column under a closet rod with at least 5 feet 4 inches (1.63 meters) of clearance, measured from the top of the rod on down. Requires just 9 inches (23 cm) between the closet rod and the back wall when used with the boots facing the wall, or 11 inches (28 cm) with the boots facing you. The Boot Bulter is Perfect for anyone who want to save space in their closet and keep their boots in premium condition. 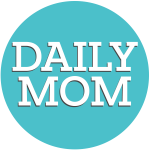 Frustrated that her kids’ fresh blueberries were warm and mushy by lunchtime no matter how she tried to keep them cool in their lunch boxes, Melissa Kieling came up with the idea to create a freezable lunch box. 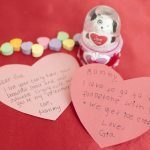 She created a prototype on her dining room table with quilted gel ice packs and a shower curtain, and asked her dry cleaner to sew it together for her. 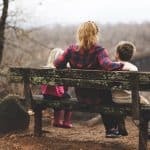 The next day, she sent her kids to school with her creation; and shortly after, people began asking her to make freezable lunch bags for them. In 2009, she teamed up with a friend and founded Packit, producing the first freezable, foldable lunch bag – The Personal Cooler – that could keep food and drinks cool for up to 10 hours. Since then, the Packit brand has expanded their product line to freezable lunch bags, grocery bags, picnic bags, wine bags and more. Made with freezable gel built into the liner, the freezable double wine bag will keep wine chilled for up to 10 hours. 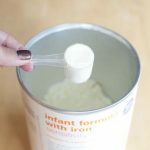 Simply fold the bag flat and place it in the freezer overnight. This bag is perfect for traveling with wine or spirits (both short and long distances), bringing wine to parties or keeping your wine cool while outside during a concert or picnic. Made with a zip closure and convenient shoulder strap for carrying, the freezable double wine bag is PVC, BPA, phthalate and lead-free. Never again will you or your loved ones have to drink warm wine, search for ice buckets or chill room-temperature wine in the freezer before you can enjoy it. Carry your chilled wine to your destination and place it back in the bag after use to keep it chilled throughout the duration of your stay! 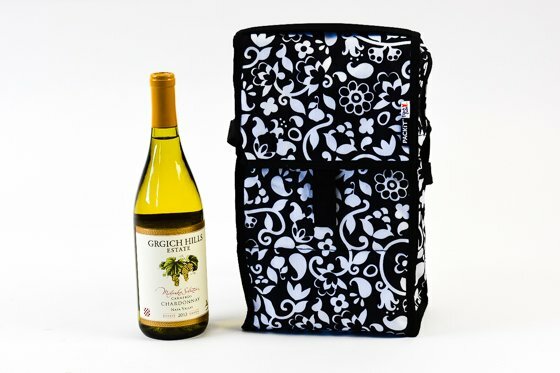 The Packit freezable double wine bag is perfect for the wine enthusiast in your life. With the ability to chill bottles for up to 10 hours, wine lovers can enjoy their wine anywhere – both indoors and out! 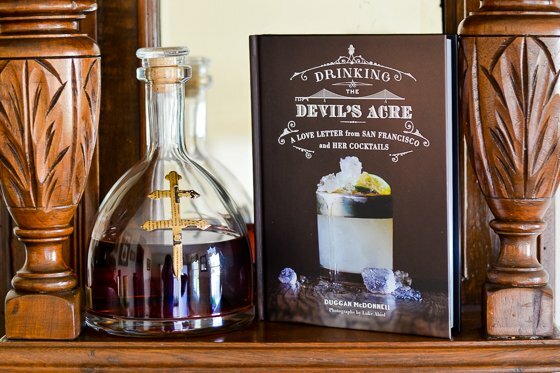 Drinking The Devil’s Acre – A Love Letter From San Francisco And Her Cocktails is a masterfully crafted mixture of San Francisco’s “spirited” history and author Duggan McDonnell’s tales of his days as a bartender, all tied together with 25 insatiable cocktail recipes that all rooted from the Bay area. Inspired by the infamous Devil’s Acre – a single, bar-filled block that housed some of the wickedest and wildest bars in America – that sat just a few blocks away from the marble-floored drinking palaces that mastered the art of the cocktail, Duggan McDonnell knew that he wanted to write something unique as a tribute to San Francisco and her cocktails. 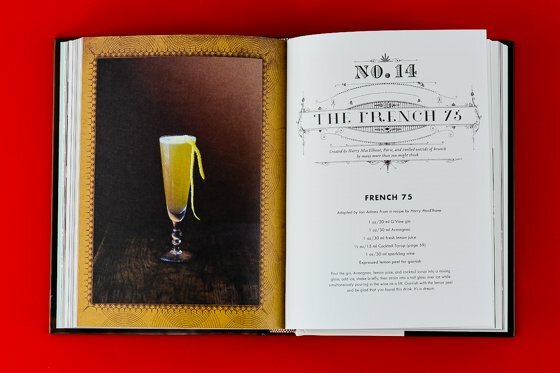 This book is not just a beautifully laid out recipe book (although you will find 25 of the most delicious cocktail recipes around); it is a story of how they were born. This story flows in a way that one should read Drinking The Devil’s Acre from cover to cover, and not just hop around from recipe to recipe.